Xiaomi ROAD FC 032 will take place this coming 2 July, 2016 at the 20,000-capacity Hunan International Conference and Convention Center in Changsha, Hunan, China. The Main Event will be “China’s Heavyweight Supernova” Aorigele (4-3, Jinzheng Pharmaceutical Group) versus Bob “The Beast” Sapp (11-18-1, Team Bodyshop MMA). China Provincial Sanda Champion Aorigele literally burst onto the MMA scene two years ago at only 19 years old, with a whopping 140kgs on his 188cm tall frame. He knocked out his first opponent in just seven seconds, and didn’t need much more time in his ROAD FC debut. At Xiaomi ROAD FC 027 in Shanghai for the opening round of the first Openweight Tournament, Aorigele finished off “Ex-Yakuza” Kim Jae-Hun in 24 seconds, with referee Herb Dean using every bit of his might to pull the behemoth off of the ground and pounded out Korean. Aorigele advanced in the Openweight Tournament to face “Techno Goliath” Choi Hong-Man. The charismatic Xi’an Sports University product bravely rushed his towering opponent and swarmed him with punches. But Choi’s power was demonstrated when he KOed Aorigele standing with a short inside right. Aorigele, undaunted in his climb up the ladder of the most massive division in MMA, will next face another giant in the form of Bob “The Beast” Sapp. Sapp, recently serving as ROAD FC’s Vice President in charge of Global Public Relations, will set aside his seated duties to stand in the cage as a professional fighter once again. “The Beast” made his mark on the kickboxing and MMA world in a big way – the 350-pound muscle-bound monster made his debut in PRIDE in 2002, going 2-0 before Antonio Nogueira submitted him at the historic PRIDE Shockwave. Sapp participated in the DREAM Super Hulk Grand Prix, the 2002, 2003, and 2005 K-1 World Grand Prix, and was the Champion of the 2005 K-1 Hiroshima Grand Prix. He stood in for injured fighters like Remy Bojansky and Gegard Mousasi, defeated Ernesto Hoost twice, and always made a huge impression on the fans in his fights. 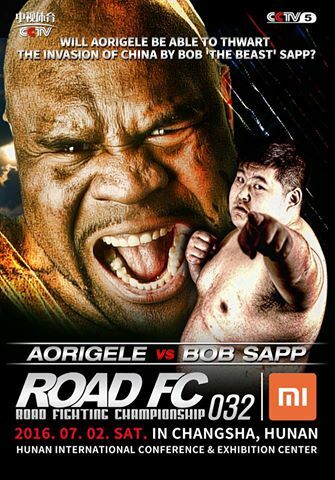 Aorigele versus Bob Sapp in an Openweight showdown is guaranteed to lift the roof off!